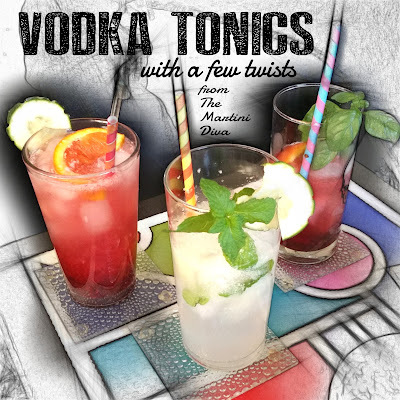 Vodka Tonics? Not Really. Fun? Yes! Except for one odd day in February, yesterday was the first truly hot day of the year and, after several weeks of freakishly cool May days, the temperature of 90° felt more like 110°. That first blast of summer called for some very tall, ice filled, refreshing cocktails for myself and my visiting company, Will and Stephen. Only problem? I was hot, tired and didn't want to get up and down and behind a bar mixing drinks every ten minutes. I wanted to sit down and enjoy a couple of tall, iced filled cocktails myself. Solution? 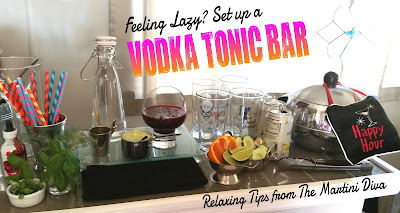 Set up a Vodka Tonic bar and let the boys do their own bartending! Then I mixed myself MY cocktail, sat down and directed their activities from my favorite chair. I got to relax, they had fun AND got a mixology lesson in the bargain. Win, win, win. The second round it was musical cocktails as we switched the combos around. The third round is now a blur but suffice to say we emptied off the bar before commencing to supper. For a bigger party, where I had more time to plan, I would have added more fruit choices, expanded the spirit choices, added more mixers and moved it all over to my long window bar). However, for something I tossed together in a few minutes this worked. Hilarity and creativity ensued, I sat on my keister and laughed and kibitzed, they mixed and muddled and spilled. A good time was had by all. And I conned Will into washing up.